Quicknotes – NetBrix – "your go to techies!" Used to post quick small notes as posts. Also the default category for post by email. Often times, during server migrations across control panels (or in the absence of control panels), one needs to copy email which the client wants to preserve. IMAP allows us to be lazy and leave all our years of communication online on our servers. So when a client insists that they need their email moved you’re left with the supremely boring task of setting up the two imap accounts in an imap client (thunderbird or outlook), one from old server the other from the new one, downloading all mail from old server then dragging across all the folders to the new server. Extremely slow and frankly frustrating….. Enter imapsync (well it’s been around for 3 years at least maybe longer). This will setup the dependencies etc. and you should now proceed to the actual mail copy. Now just sit back and relax as the script logs into both servers, figures out what all folders to subscribe to on the source server, displays the counts and then starts the copy process. If you login to your mail client on the new server you should see all the mail from your old server. cheaper (in terms of time). To rebuild follow these steps. where all subsequent updates to master need to be applied to slave. output) for the purpose of mirroring all writes to the master db. why they cannot get write locks on the tables they wish to write to. Done, now start a backup of the databases from master. 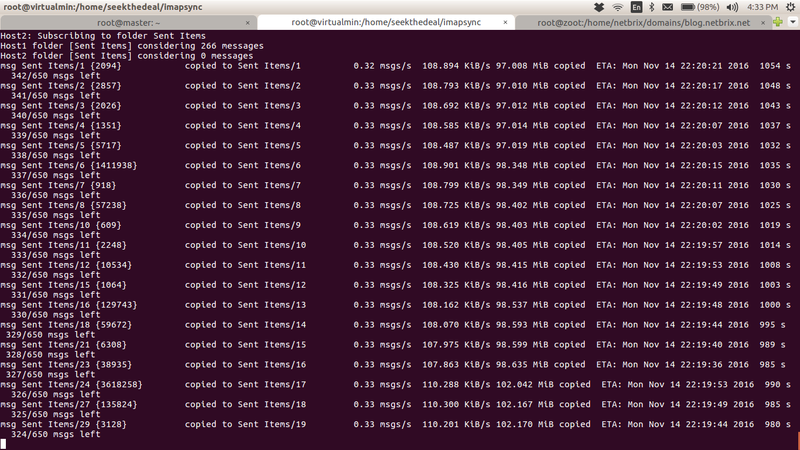 using rsync, scp or whatever you prefer. IMPORTANT: Now we are on the slave server. improvement if you turn of bin log). out how to fix this situation. copy that and run it on the slave. the INSERT statement that are puting the data into the . happily purring away powering the websites/application. run this on both slave and master and compare the numbers. your slave servers integrity and also the integrity of your drives. happiness specially if it’s business critical data.